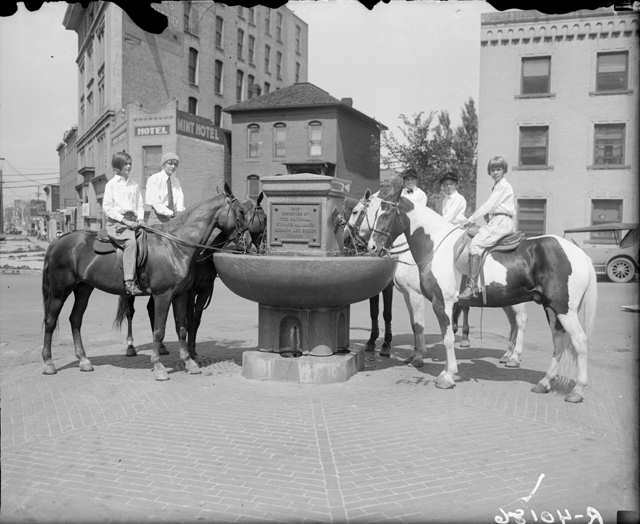 B50 Note: Between 1906 and 1912, the National Humane Alliance presented somewhere around 125 Horse Watering Troughs to cities and towns across the country, including Denver. Hermon Lee Ensign, who died in 1899, dedicated his fortune to funding the National Humane Alliance in order to “spread about humanitarian ideas among the people.” Such education, Ensign hoped, would instill in people, “especially the young, ideas of humanity both to the lower animals and to each other.” The fountains were produced in Vinalhavan, Maine. 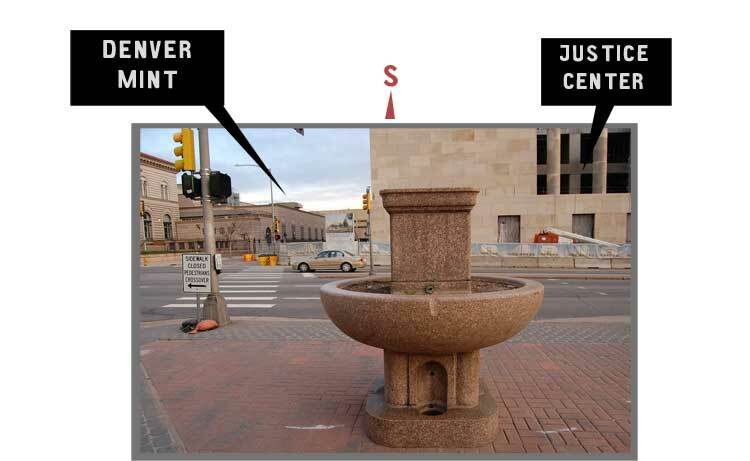 One of the fountains was recently relocated to a park in Derby, Connecticut — the community has a web page that offers great information. 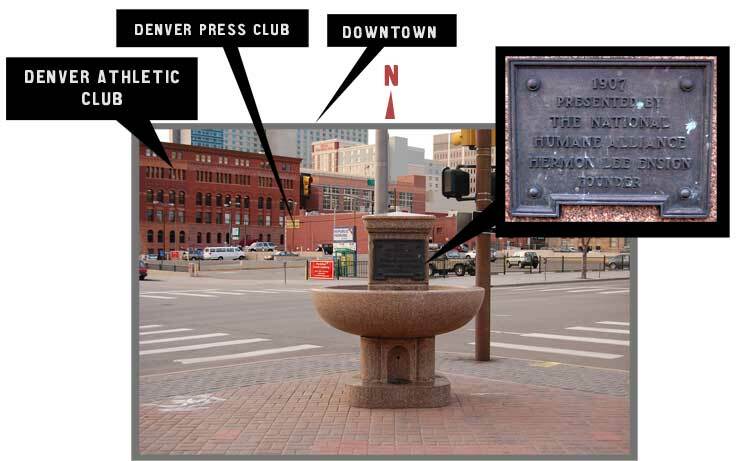 The Denver fountain is located in a small paved triangle in the Civic Center District, where Colfax, Tremont, and 13th intersect. 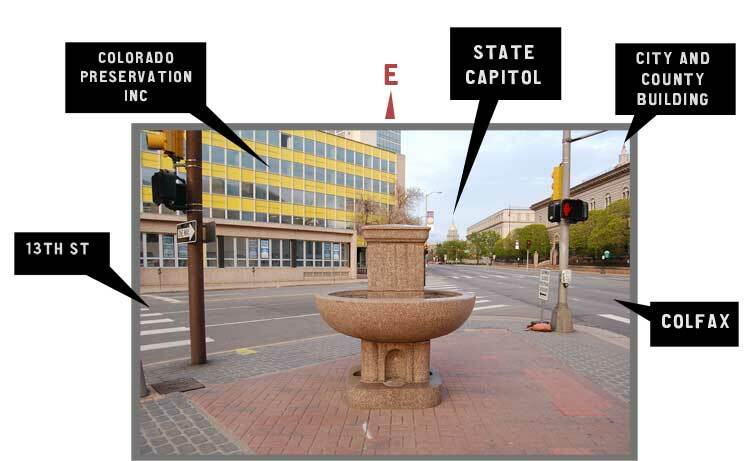 Unfortunately, the fountain no longer works, and the basin is filled with soil, which makes it hard to recognize its original purpose. The following photo was taken by Harry Rhoads in 1920 (courtesy of the Western History Department of the Denver Public Library). 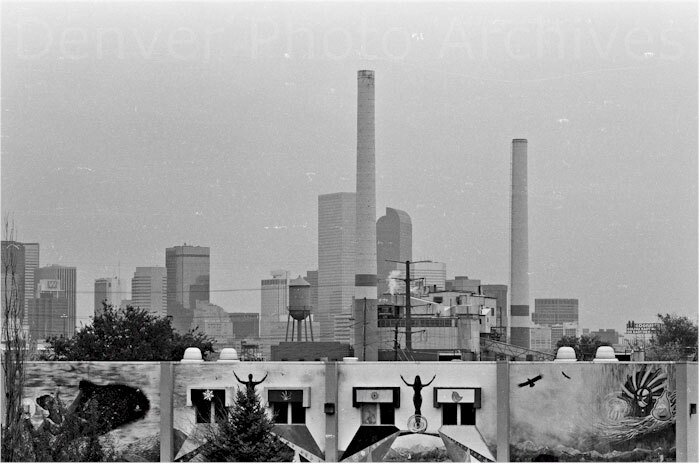 Back in the 80’s and 90’s I photographed some of Denver’s architecture. 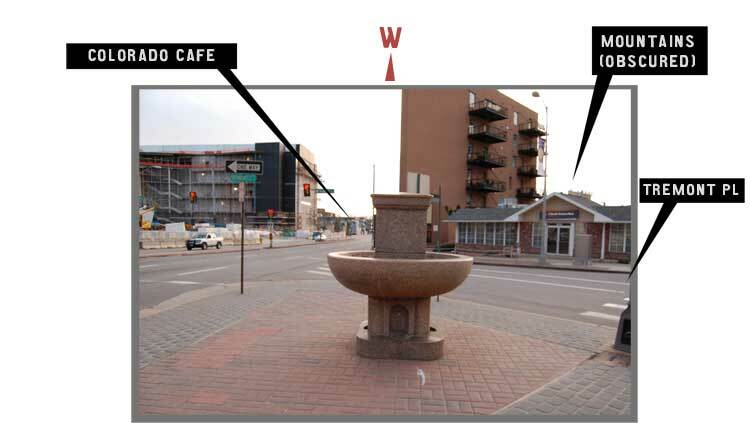 This period was the transition of some of Denver’s past architectural heritage and merging of contemporary designs. I had to document some of these buildings before they were gone; it was a tremendous experience. Buildings have a little bit of us in them, and we in them, we need each other. Let us go out and revisit some of these links of our lives in a brief little journey. B50 Note: Kim Allen is a photographer who extensively chronicled the changes that occurred in downtown Denver in the 1980s and 1990s. For more information on Denver during this era, visit Kim’s website at denverphotoarchives.com. Photographs and text are provided courtesy of the artist (©1884-1992). 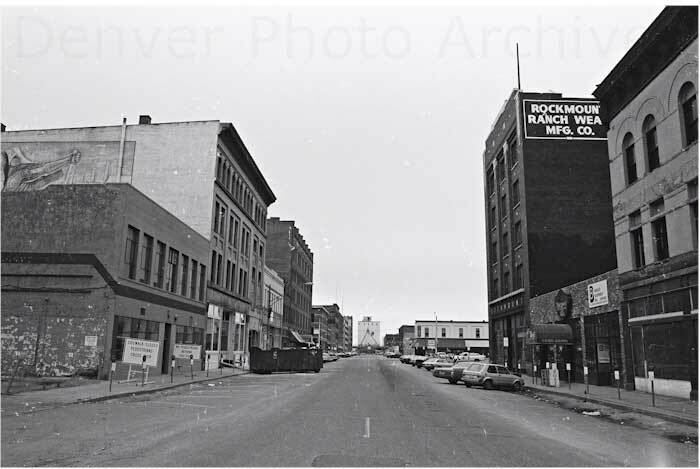 The Rockmount Building celebrates its 100th birthday this year, but the history of the site goes to 1859. As my family has been working at this building for 3 generations it feels like part of the family. 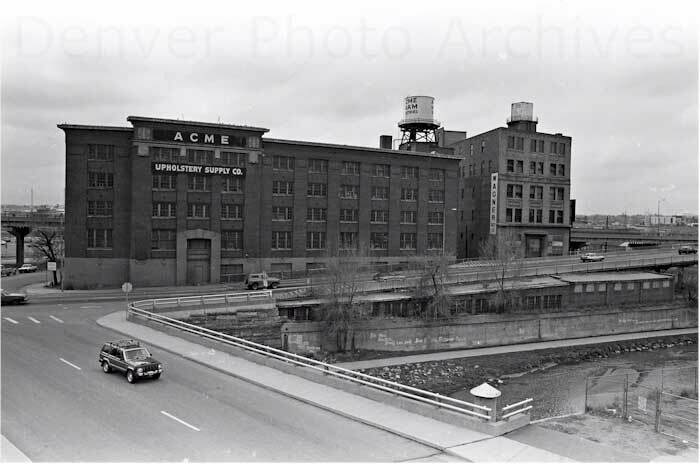 I began researching the building several years ago after I discovered it was designed by Fisher & Fisher who designed some of Denver’s finest buildings. 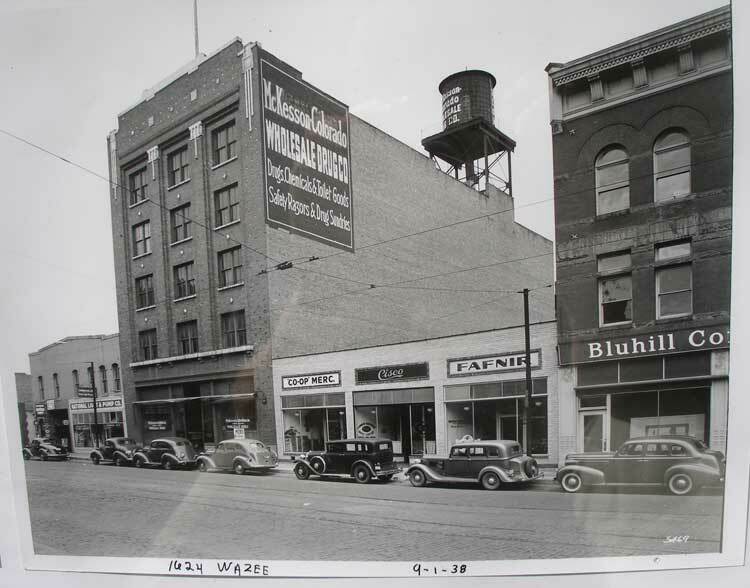 I have a huge archive on the building as well as our business Rockmount which is notable for making the first western shirts with snaps and Papa Jack who was the oldest CEO. On display in our store is a triptych panel of photos of the building and the street over the years. We have the original abstract of the building, which dates to 1859. 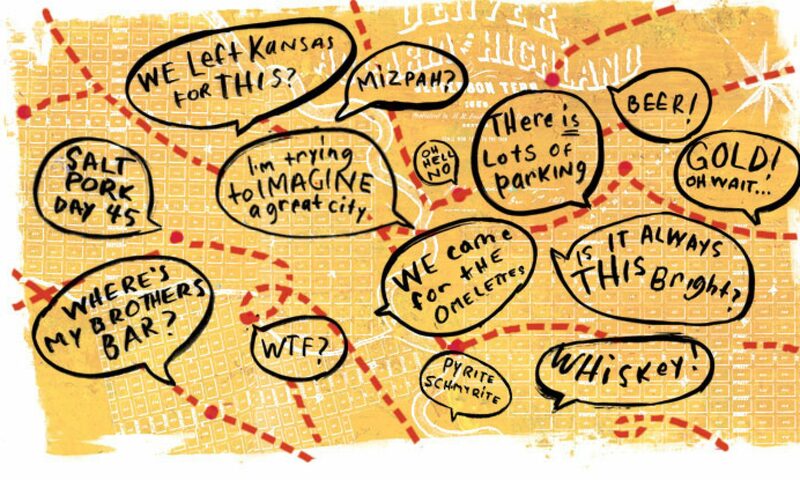 It has signatures of many of Denver’s founding fathers: Amos Steck, David Moffat, Frederick Ebert and others who tie in to the city’s history prominently. Amos Steck was the first mayor and for whom the Elemementary School is named. David Moffat and others brought the railroad spur from Cheyenne to Denver without which we would be Cheyenne and they would be Denver. Frederick Ebert platted LoDo and the roads to the Central City mines. He and his wife gave the land for the first school. Today Ebert Elementary is named for him. Of note is that Wazee was part of China town, though most people think its border was Blake. The Rockmount abstract shows Chinese owners in the 1880s. Many of their businesses were off the alleys. The Wolff Building, circa 1909. Designed by Fisher & Fisher. Photo Courtesy of the Colorado Historical Society. Built in 1909, this building has been Rockmount’s home for 3 generations since 1946. First our warehouse, we later moved our offices here in 1980. After nearly 50 years of wholesale only we opened the retail store and museum in 2002. We undertook a historic renovation to preserve the building in 2004, returning the first floor much to its original state. This “Prairie” style building was designed by Fisher & Fisher, perhaps Denver’s Finest architects. Where as many earlier nearby buildings are soft brick this is a costly construction with fully fired brick throughout and heave timbering far exceeding structural requirements. Warehouses were once architectural gems reflecting the commercial lifebood of a growing community on the frontier. This was a time when warehouse architecture expressed the great pride of other citadels such as civic, chuch, and corporate edifices. The Rockmount building reflects Louis Sullivan’s Modern Commercial design, the emerging Prairie style of Frank Lloyd Wright and the Beaux Arts movement, which Arthur Fisher studied in New York. This building is a complete departure from the more derivative Victorian classical motif style, characterizing much of the neighborhood. 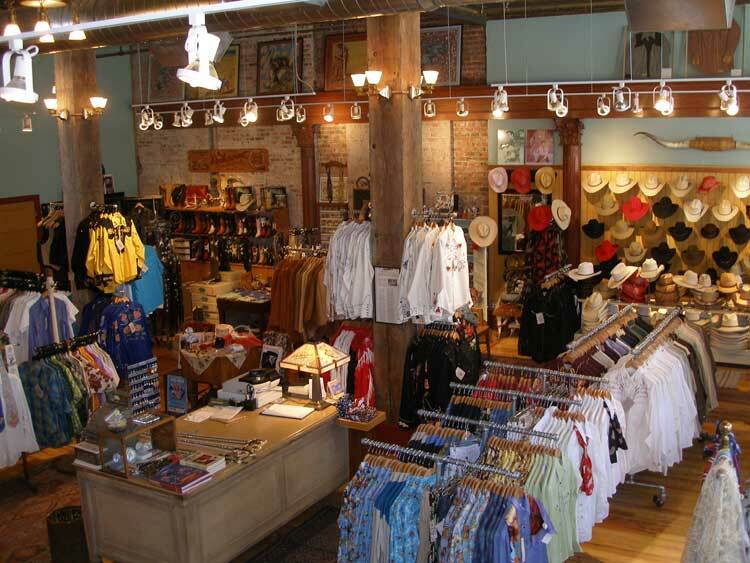 1946 – Present	Rockmount Ranch Wear Mfg. Co.
B50 Note: Steve Weil is the president of Rockmount Ranch Wear. The company was founded by his grandfather, Jack A. “Papa Jack” Weil, who is considered the father of Western Wear. Steve’s father, Jack B. Weil, joined the company in 1956, and Steve joined in 1981. Today, Rockmount is sold widely around the world. The Rockmount Building will be open on Saturday and Sunday, April 18th and 19th, as part of Doors Open Denver 2009, a program of the Denver Office of Cultural Affairs. For more information, maps, and a list of participating sites (there are lots of them!) visit the Doors Open Denver website. During the winter of 1978-1979, as a senior in high school, some friends and I would head downtown on Friday nights for the midnight showing of The Rocky Horror Picture Show at the Odgen Theater. Coming down from the Evergreen and not knowing much about the city, we needed some way to amuse ourselves until 11 or so when we would line up on Colfax for the show. We weren’t much interested in 3.2 bars, and didn’t know where else to go, so we used our imagination and willingness to bend the law a bit to explore parts of the city that were much less crowded then than now. 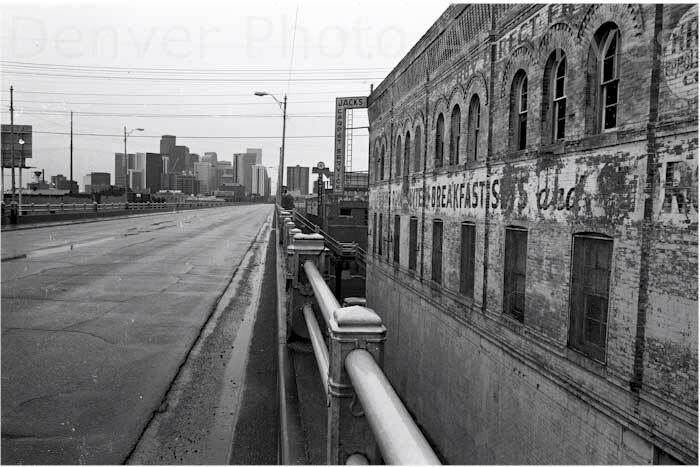 Looking back on it, the late 1970s were a good time to be an urban explorer in Denver; urban renewal left lots of buildings empty and available. One of the biggest targets for exploring was the Tivoli Brewery. It was huge, dark, and very, very spooky. Although we only snuck in there a couple of times, it left a considerable impression on me; we’d park a few blocks away, squeeze through the fence and into the building (not a difficult thing to do), and then spend as much time as we could wandering through the cavernous spaces. I remember the iron work, the incredible (and confusing) machinery, thousands on thousands of denver beer bottles, the massive copper vats. One very cold night we spied a plastic glove extending up from an icy vat (it was a glove, wasn’t it? ), a vaguely disembodied hand, which led to some extra hoots and hollers in the echoey darkness. 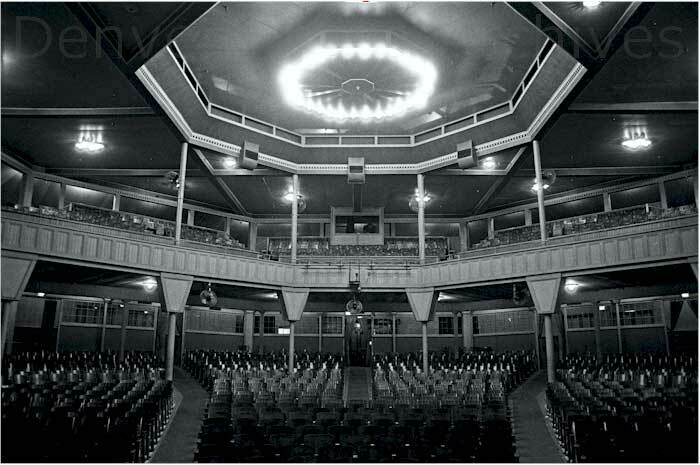 There was the turn halle, with its raised stage at one end, perfect for improvisational performances. But more than anything I remember the feeling of being dropped into a place frozen in time — as if the work had simply stopped one day, and everyone dropped what they were doing and walked out the door — we were space travelers on a long abandoned ship. 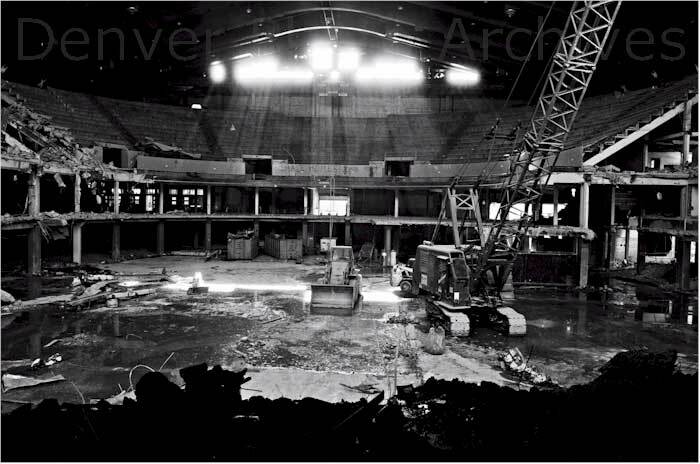 I didn’t know anything about the history of the Tivoli in those days, and as it turns out it was several years before a plan emerged for what to do with it (a plan that ended up changing more than a few times before the current incarnation as the Auraria Student Union and home to the Denver Film Society). Of course, now I realize that even as we were exploring our “alien landscape”, there were lots people working to secure a renovation plan while others documented and researched the history of this unique feature of the Denver landscape. The following is a transcript of the “Historic American Engineering Record” conducted by the National Park Service in 1983; the text was transmitted by Dan Clement, and the photos are by William Edmund Barrett. This document was retrieved from “Built in America“, a project of the Library of Congress documenting American buildings and landscapes from 1933 to the present. Significance: The Tivoli Brewing Company is one of the last gravity fed breweries in the United States. The history of the Tivoli Brewing Company spans more than 100 years and encompasses the development of three different breweries. James Good crossed the prarie in 1859 with the first wagonload of hops for Denver’s initial brewery, the Rocky Mountain Brewing Company. In that same year Good became associated with the brewery’s owner, Mr. Charles Endlich. Good, known to have been a master brewer in Europe, ran the brewery during the 1860’s. 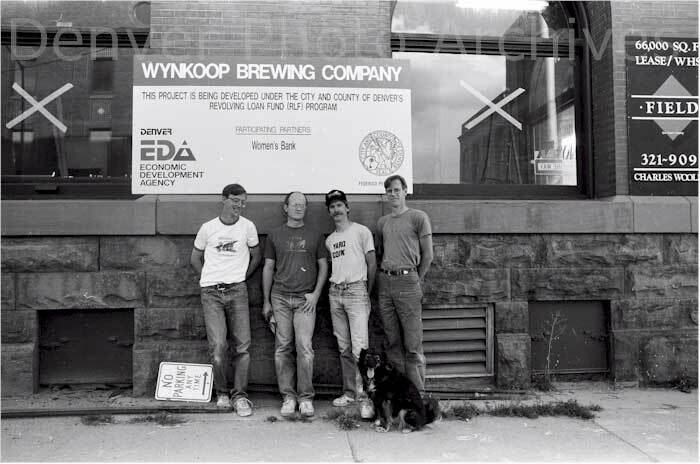 At that time, the brewery was located on the western shore of Cherry Creek in Aurarla, a rival community adjoining Denver. Sometime during the middle of the decade Endlich died and Good became sole owner of the facility. In 1870, he changed the name of the brewery to the Tivoli Brewing Company (named after the Tivoli Gardens in Copenhagen). In 1879 another brewery in Aurarla started production. The Milwaukee Brewing Company located at 10th and Larimie was known not only for its beer but also for the construction in 1882 of Vorkwaert’s Turn Hall. 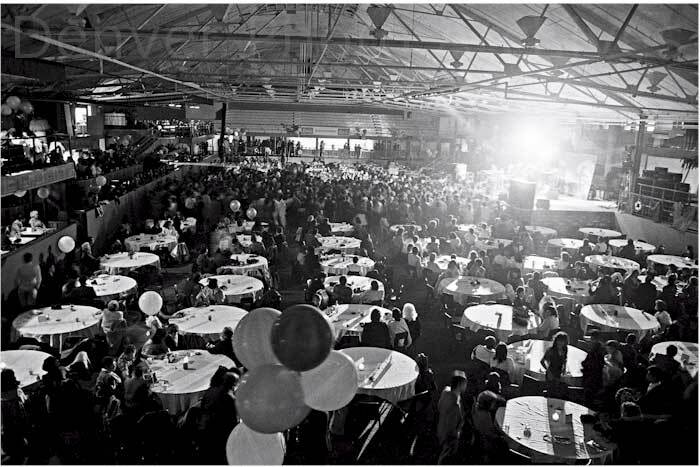 The hall was used to stage club shows and operas and proved to be quite popular with the people of Auraria. In 1890 the company constructed a new four story brick structure with tower and basement. This structure survives today as the most visually distinctive building within the complex. A shallow three story connector between the turn hall and the new building was also constructed in 1890, most likely while the new tower building was still under construction. 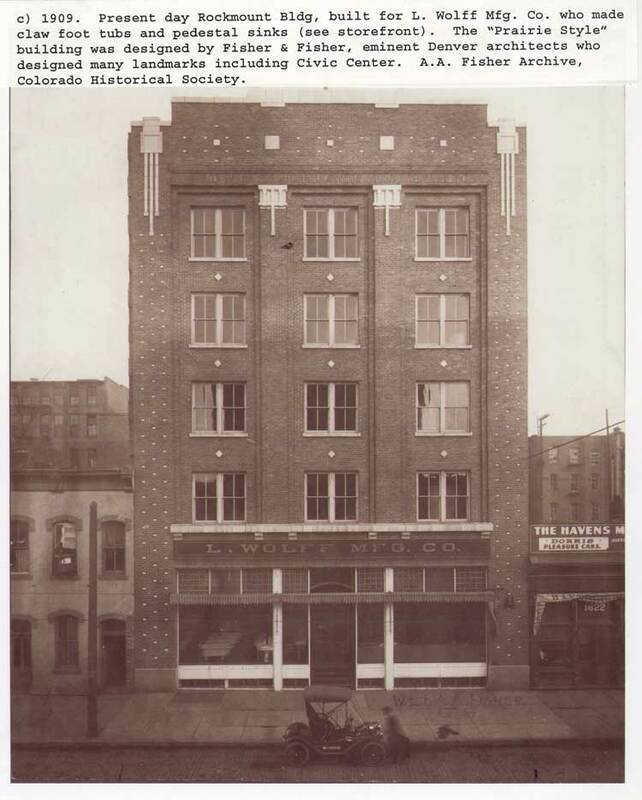 By 1901, the Tivoli Brewing Company had merged with the Union Brewing Company, owned by William Burghardt (a friend of James Good) and it occupied the site of the Milwaukee Brewing Co. on 10th street. About this time it is believed that the buildings to the south and east of the tower building were constructed. The Tivoli-Union Brewing Co. continued to operate (barring prohibition) under the ownership of Burghardt, Good and Good’s heirs until 1964. With the death of Mrs. LoRaine Good Kent Vichy (a daughter-in-law of James Good) the ownership of the brewery remained in litigation until the complex was sold to Carl and Joseph Occhiato in 1965. Four years later the brewery ceased operation. After being considered as a possible student center for the new three college Auraria Campus, the brewery is today undergoing renovation for a different purpose. The existing buildings are to be united under a skylight-greenhouse creating a mixture of shops and exhibit spaces that will serve commercial interests within the local economy. Letham J. Historical and Descriptive Review of Denver, Her Leading Business Houses and Enterprising Men, Denver 1893. Smiley, Jerome C. History of Denver, The Times-Sun Publishing Co. Denver, 1901. Brettell, Richard R. Historic Denver The Architects and The Architecture 1858-1893. 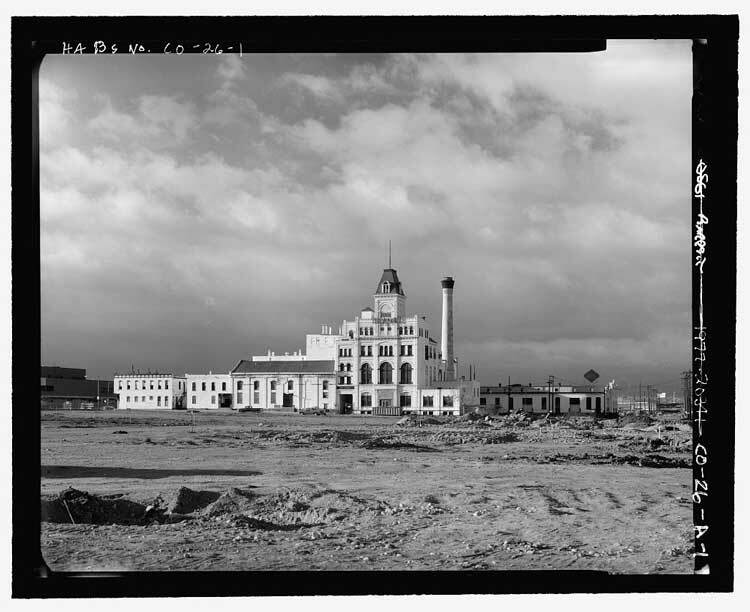 CO-1-1 Side view of brewery complex, smokestack looking toward Larimer Street. CO-1-2 Side view of brewery complex as seen from 10th and Larimer. CO-1-3 Ninth Street view of brewery showing rear of 1890 tower building and HI-EN Brau stone building, one of the oldest structures remaining. CO-1-4 Tower and upper front facade of tower building. CO-1-5 Side view of tower and upper facade. CO-1-6 Tivoli Beer wall sign, smokestack and adjacent building to tower: WEST DENVER TURN HALLE 1882. CO-1-7 Tower Building interior. First view of plant behind offices Equipment and double iron steps to 2nd floor. Beer parties were also held here. CO-1-8 Tower building. Large copper brewing kettle on second floor. CO-1-9 Tower building. Hot water tap floor shown. Mixing vat at center level. Juices mix and flow and left lower level. Copper kettles are down below view level. Looking toward front of building. CO-1-10 Copper taps below mixer and above copper kettles. CO-1-12 From here grain goes to the top of the tower from rail cars down below. From here grain flows by gravity through different processes ending up as beer in the basement. CO-1-13 Top of tower. Grain proceeds from here through gravity fashion. CO-1-14 “Grinder: Seek Brs. Ltd. Dresden. Chas. Zeller Co. New York.” Second machine in grain procession from top of building. This is the floor beneath the top of the tower that the grain drops through. CO-1-17 Same floor.as hot water vats looking towards the front of the building. These have to do with grain from upper floor judging from ceiling to floor progression. Note nice iron work. CO-1-18 Inner back wall of 1890 building above hot water vats. CO-1-19 Taber pump in C02 plant. CO-1-20 Vilter Mfg. Company steam engine. CO-1-21 Same steam engine from other side. CO-1-22 Repair Shop. Note Schnitzelbanks in center front. CO-1-23 Beer Cooler. Copper tubing very obsolete. CO-1-24 Lab Room. Balance scales and other gear.